Want to Change Facebook Theme, Color & Appearance? Read more in this Web Guide about it. As we all know Facebook is the biggest Social Media site that enables us to connect to our friends and families. It also helps to build relationships with people all around the globe and find new friends too. But using the same Facebook background or should I say theme is a very boring thing. You must have wondered if there is any way to change Facebook theme, color and appearance. But the bad news is that Facebook doesn’t allow such options. I have come across few of my friends that consider it frustrated while visiting Facebook every time and see the same old boring blue color theme. You may know that it is possible to change themes in Twitter and MySpace but not in case of Facebook. And now it is a thing of the past and using a Firefox Addon you can now change the Facebook theme to your wish. 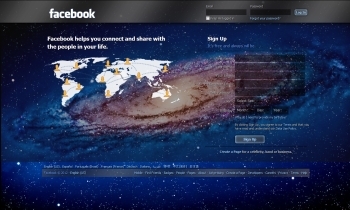 Various free themes for Facebook are available on the Internet to look out for. Once installed it would look like the image given below. You may like our Tips on Best FB Chat Tricks. Requirement: you will need a Mozilla Firefox 3.5 browser or any higher version of this browser. Steps Change Facebook Theme: you have to follow the steps given below to change the Facebook theme via Firefox Addon. Just follow the on screen instructions to install the addon on your Browser. Once this Firefox Addon is installed you need to restart Firefox. After restarting just Login to your Facebook Account and locate the small ‘S‘ button on your Firefox status bar in the bottom of the left hand side and click on it. A drop list will appear so choose “Find Styles for this Site“, it will open a new tab on your Browser with many free themes for Facebook to use. If you want to see the preview of any theme just click on it. If you like the previewed theme and suits your taste just click on “Install with Stylish” button at the top right corner of the page. You will see a new dialog box appearing. Next, select or click on Install in the dialog box and you are done. So whenever you want to login to your Facebook account instead of boring blue colored theme you will see the theme of your choice. « Twitter Will Give You Penalty Like Panda, Penguin In Future!